Strapped for Crash | Features | Kids VT - small people, big ideas! Most Vermonters don't install or use their car seats correctly. How to get it right. A year ago this month, a 1997 Subaru Legacy heading north on Interstate 89 fishtailed suddenly in Bolton, crossed the median and collided head-on with a southbound truck. All three passengers, including a 7-month-old boy, were killed. It was Vermont's only fatal collision in 2012 involving a child in a car seat. By all accounts, no one could have survived the crash. Nevertheless, in the days immediately after, Richmond Rescue — which had responded to the scene of the accident — saw a spike in the number of parents coming in to get their car seats inspected. Why? Because the Vermont State Police reported the baby's car seat hadn't been properly installed. Unfortunately, it wasn't an aberration. Michael Chiarella, director of operations at Richmond Rescue, found that eight of every 10 seats he inspected that week had been installed incorrectly. While that figure might sound high, it's typical for Vermont, as well as most other states. According to the Governor's Highway Safety Program, Vermont had an 84 percent car seat "misuse rate" in 2012. The national average is 80 percent. Car seats today are used in hundreds of different vehicles, and getting one to fit your particular year, make and model can be a challenge. Plus, a new car seat typically comes with a fat instruction manual, often prefaced with several pages of bold-lettered warnings, which can be hard to follow. Chiarella doesn't blame parents for getting it wrong. "It can be really frustrating," he admits. He says he's installed hundreds of car seats and still occasionally has trouble with one. "Most of the correct installations are done by parents who have been really vigilant, reading through every single thing in the manual and doing their research online." Further compounding parents' confusion is the discrepancy between state laws and recommended "best practices" — both of which can change from year to year. This confusion makes it hard to determine when a child should graduate from one level of restraint to the next. Understanding a few fundamentals about car-seat safety — and how the seats are supposed to function in an accident — can help DIY types. Those who need assistance can get it from a number of local resources. We've simplified some of the expert advice and recommendations below. It's no substitute for reading your car-seat manual, but hopefully points you in the right direction. State law requires that young children use "an approved child restraint" — aka a crash-tested car seat designed for infants and children that meets Federal Motor Vehicle Standard No. 213. 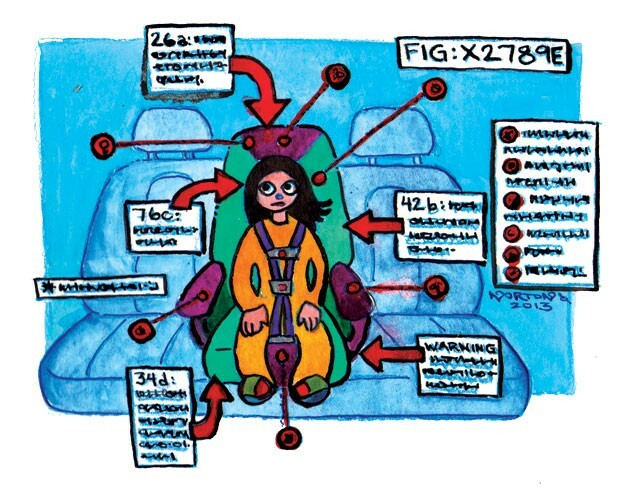 There are three basic types of car seats: rear-facing, forward-facing and booster seats. Rear-facing seats and most forward-facing seats employ a five-point harness to secure the child. Why do kids need car seats? Weinstein notes that child-size heads are proportionally larger than adult ones, which means kids are propelled head first. And kids have softer bones and less developed skeletal structures, making them more susceptible to crushing injuries. Car seats restrain and protect them. Chiarella, who's been an EMT at Richmond Rescue for the last seven years, says he's seen very few serious car accidents involving children. But when they have occurred, the child seats have made an enormous difference. He remembers an SUV rollover a few years ago on I-89. When first responders arrived on the scene, the parents were "all banged up" and had to be transported to the hospital. Their child was found dangling upside down in his car seat but was otherwise just fine. In Vermont, all children who are under the age of 1 or weigh less than 20 pounds must be in a rear-facing car seat. Kids have to be both older than 1 and weigh more than 20 pounds to move to a forward-facing one. All kids under 8 must ride in some type of child-safety seat. But even the state's own Be Seat Smart website calls that "a minimum standard." Local safety experts claim that state mandates don't measure up to the latest scientific research. In 2007, the Children's Hospital of Philadelphia conducted a study comparing injury rates for kids who were in rear-facing car seats to those who were forward-facing at the time of their accidents. It found that rear-facing kids had a 500 percent lower rate of injuries than those who were facing forward. As a result, the American Academy of Pediatrics and the National Highway Traffic Safety Administration issued a joint statement in 2011 recommending that all kids stay rear facing at least until age 2. They also recommended that the time frame for each stage of child restraint be extended, so that kids face the rear longer, stay in their child seat longer and move from a high-backed booster seat to a low-backed one at a later age and/or greater weight. The NHTSA now recommends that kids stay in a car seat with a five-point harness until they're at least 4 years old and weigh 40 pounds, though local experts say it's preferable to wait until they're 5 or 6 to graduate them to a booster seat with regular seat-belt restraint. That's when the iliac crest in their hips is more developed and can hold a seat belt down, preventing it from riding up in an accident and crushing their internal organs. If children graduate to a booster seat too early, says Weinstein, there's a possibility they can slide under or over the seat belt. Weinstein warns against "premature graduation" — moving a child from a rear-facing seat to a forward-facing one, or from a forward-facing seat to a booster seat, simply because it's more convenient for the parent. "Every step forward with car seats is a step down in safety," she cautions. Rushing it may also be against the law: After age 8, kids must either be in a car seat or secured by a "properly fitting" seat belt. (See seat-belt test sidebar). Weinstein goes on to note that the average seat belt in a car is designed to fit a 5-foot, 10-inch man who weighs 175 pounds. "We wouldn't ask a child to wear his dad's shoes," she adds. "This is the same thing." Getting a car seat? Find out where it came from. Some parents assume it's OK to buy a used car seat or borrow one from friends. Bad idea! Local experts say it's never safe to acquire a used car seat unless you know for sure that it's never been involved in an accident. Even a minor accident can render it unsafe. For this reason, experts also warn parents to avoid car seats provided by rental-car companies, as their histories are unknown. Furthermore, if you're using a secondhand car seat, you don't know whether there have been any manufacturer recalls. Additionally, all car seats have an expiration date, typically after six years; it's stamped on the base. Why do car seats expire? As Chiarella explains, the belts and plastic covers deteriorate in the sun and heat, which, on a sunny summer day, can exceed 150 degrees in a car. Best advice: Buy a new car seat. If you can't afford one, or don't know where to get one, call your city hall. Many police departments, fire departments and rescue squads sell them, often at a financial loss. Richmond Rescue, for example, will provide car seats to people who qualify for public assistance such as WIC, Dr. Dynasaur and Medicaid for only $20. That's a bargain, Chiarella notes, considering that the cheapest seats at Walmart start at $40. If parents still can't afford it, "we will send them away with one that's safe for their kid," Chiarella insists. Where a kid sits in the vehicle is crucially important. Children should never ride in the front seat of a car, due to the danger of a front-airbag deployment. Airbags in the front seat explode at 250 to 300 miles per hour. Side-curtain airbags, especially in the backs of cars, deploy at a much lower velocity, making them safer. Nearly all vehicles manufactured in the last decade have a Lower Anchors and Tethers for Children (LATCH) system, which are the anchors found beneath the rear seat. If possible, a single car seat should be secured in the center of the back seat, provided the car's seat belts or LATCH system are designed to accommodate a center-mounted seat. Otherwise, kids should be in car seats on either side of the rear seat. Chiarella says the most common mistakes he's seen at inspections are ones that are easily fixed: child restraints that aren't cinched snugly enough against the car's rear seat; seat belts that are threaded through the wrong pathways; seat belts that aren't locked; and seats that are tethered to the wrong anchors on the car. "Some were attached to cargo hooks, which are designed to hold a 10-pound bag of groceries" — nowhere near the force exerted in an accident, he says. Chiarella has also observed parents who didn't know how to secure kids properly in their seats, or had them facing in the wrong direction for their age and weight. Another common mistake parents make is not removing kids' winter coats and snowsuits before securing them in their car seats. Bulky clothing can prevent the five-point harness from being tightened enough to restrain the child in a crash. Equally bad are zippered car-seat inserts such as Bundle Me and other wool or fleece covers meant to keep babies and toddlers warm during the winter. These and other after-market products that get attached to child seats — including cup holders, mirrors and dangly toys — void the warranty, warns Weinstein. "If it doesn't come with the seat, it hasn't been crash-tested with the seat and we don't know how it's going to behave in a crash," she says. Her advice: "Avoid them all." 84%: Vermont's car-seat "misuse rate" in 2012. The national average is 80 percent. 500%: Studies show that rear-facing kids had a 500 percent lower rate of injuries than those who were facing forward. Age 1: All children who are under this age or weigh less than 20 pounds must be in a rear-facing car seat. Kids have to be both older than 1 and weigh more than 20 pounds to move to a forward-facing one. Age 4: The NHTSA recommends kids stay in a five-point harness until they're at least this age — and weigh 40 pounds. Age 8: After this age, kids must either be in a car seat or secured by a "properly fitting" seat belt. 5' 10": The average seat belt in a car is designed to fit a man of this height who weighs 175 pounds. How do you know when your child is ready to use an adult seat belt? Does your child sit all the way back against the auto seat? Do your child's knees bend comfortably at the edge of the auto seat? Is the lap belt on top of his or her thighs? Is the shoulder belt centered on his or her shoulder and chest? If you answered "no" to any of these, your child is not ready for an adult seat belt. Find more information and a list of upcoming car-seat safety inspections at beseatsmart.org.